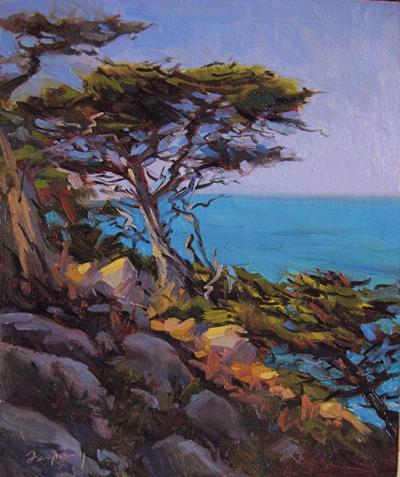 Point Lobos has so much to offer artists, and I’ve painted it many times. This painting was done from a reference photo, if I recall correctly, from the area around Cypress Cove. Many artists have captured this awesome place, including classics by Percy Gray, F. Childe Hassam, Guy Rose (1, 2), and contemporary painters Kevin Courter, Brian Blood and Robert Lewis. Here’s a Google search result of Point Lobos paintings with lots of others. Point Lobos is a place of sharp edges. Monterey Cypress branches angle sharply against the wind; the jagged rocks fight relentless, active surf; the ocean’s dark green/blues show the great depth of the inlets. With steep terrain like this, dramatic light effects are common. This view shows the late afternoon light fighting through the trees and rocks, creating slivers of light on the ground and treetops. If you ever get to Northern California, don’t miss the opportunity to paint at Point Lobos!